Israel In Prophecy » KeyIssues/Israel: God's demo for marriage? Our Conclusion: God's Word compares the relationship between husband and wife to the relationship that He wants to have with his people; conversely, the covenantal relationship that he wants to have with his people serves as the model of what a marriage relationship is to be. To make his point he uses the imagery of marriage between husband and wife, between Bridegroom and Bride. He presents himself as the husband (masculine) and he portrays his people as the wife/bride (female, assembly: Hebr. kehilah, Gr. ekklesia, the ones 'called out' ). The male/female components are not interchangeable. God is the initiator of the covenant, the bride as the redeemed community responds. Unfaithfulness is portrayed in terms of female harlotry. This theme runs through the whole of Scripture and culminates in the "marriage supper of the Lamb" (the Messiah) at the end of times. The meaning of the "Bride" is a purchased Israel remnant augmented by the "saved community" of gentile remnants from all tribes and nations all forming one Body, one New reconciled humanity that accepted Yeshua/Jesus as their Messiah. Since God is one (hebr. echad) who created man in his image as male and female to be one (hebr. 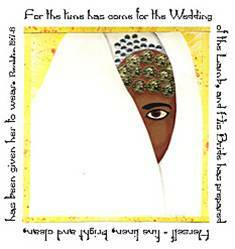 echad), God has only one bride. Although he unites both male and female characteristics in his covenantal relationship, his role is that of the Bridegroom and his people are corporately the Bride. God's plan for Israel was that she should serve as the model for marital faithfulness as the standard for the nations. Her faithfulness was bought at a high price by the Bridegroom so that she remains an object lesson both in blessing and in judgment. She is first in both, receiving twice for her sins, as a warning to all nations. Messiah's promised first offspring is in Israel, and then through this first apostolic church more offspring come from among all nations whose calling is as secure as Israel's irrevocable calling. They together form the One Church as long as her Jewish roots are not severed and the wall of partition is not raised again. She is called Zion whose tent borders have been augmented and nothing will prevail against her. She is a bride, a redeemed people, a city and a house all in one. In this sense, we see Yeshua's prayer fulfilled that Jews and Gentiles within the Israel/Church become One New reconciled humanity in the end, the promised reward of God to his servant Yeshua who rebuilt the temple of God in three days as a house of prayer for all nations. If you wonder why this imagery is so significant, look at Maud's 8 additional slide shows on THE MYSTERY OF THE BRIDE. This mystery was only revealed in its fullness in the B'rit Hadashah (the New Testament) and has a lot of implications. If you have comments, please look at the slide shows first and then add yours below. For a discussion on how far the 'Bridal Paradigm' (the biblical theme of Israel / the Church as the bride) should be applied to the individual relationship between the believer and Jesus / Yeshua see here. Hi Daniel,Yes, you're right. Choosing the right photographer is very imnrotapt.The only problem is, you never know which is the REAL and RIGHT one! There are so many photographers who claim they do weddings but a good deal are only out to make quick cash.My own wedding photos were almost ruined by this guy from Big Day Studios . Don't want to name him . I thought I had chosen the right one, after spending almost a month sifting through many photographers. I was wrong!When my pictures came back, many imnrotapt shots were out of focus, very underexposed, or had weird colour balance! In the end, I had to also painstakingly edit the images myself which took many painful months.And guess what He didn't exactly come cheap. We paid him a few thousand dollars.From the pictures I see, I have no doubt he only picked up photography not too long ago. It was a total scam to me.I hope as a wedding photographer, you could also educate the community on taking this profession seriously. For those who cannot take pics to save your life, please don't!!! Be responsible!